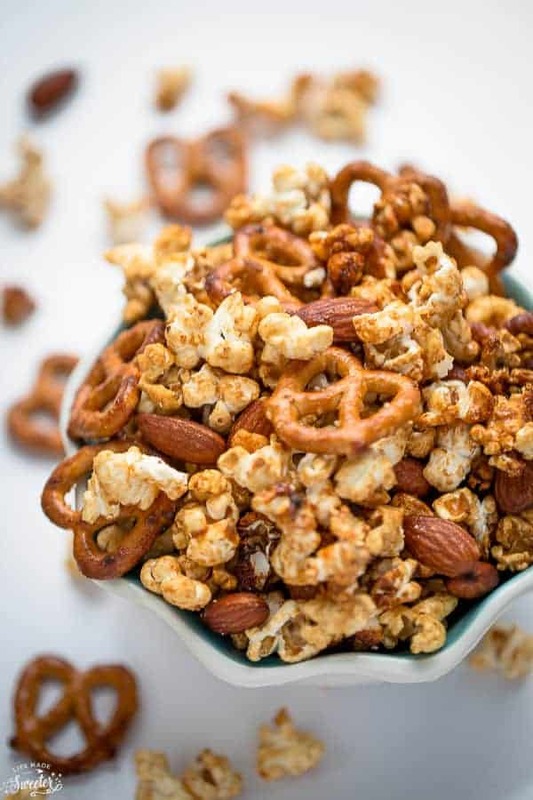 Slow Cooker Caramel Popcorn Snack Mix is sweet, smoky and super easy to make in a crock-pot. A delicious snack to enjoy during the game and perfect for giving away during the holidays. What’s your idea of a relaxing day at home look like? Curled up on the couch watching the game? Your nose buried in your favorite book or cookbook? In the kitchen baking or throwing together some apps? My ideal day at home varies depending on how I’m feeling or how much work I have but it’s pretty rare you’ll see me sitting down for too long. That’s why on Sundays when my husband has the game on, I’ll usually be in the kitchen whipping up snacks with the kiddos. 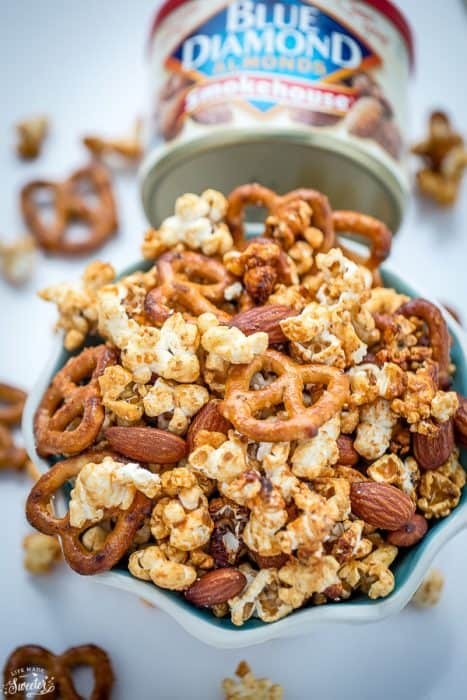 Crunchy caramel corn was always one of my favorite snacks around the holidays and this slow cooker version couldn’t be easier to make. There’s no candy thermometer involved and the sauce is pretty much foolproof. We start by adding some butter, coconut sugar (or brown sugar), honey and vanilla into your slow cooker. 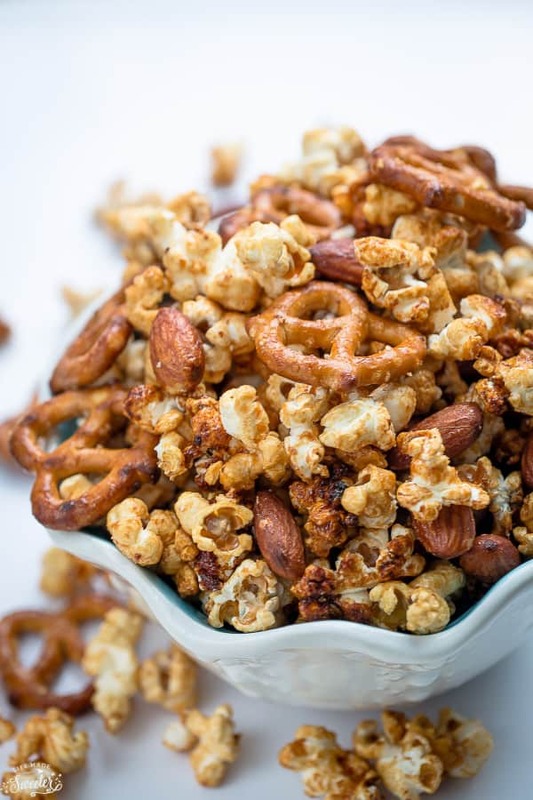 Once it’s melted, we throw in some popped popcorn and almonds. 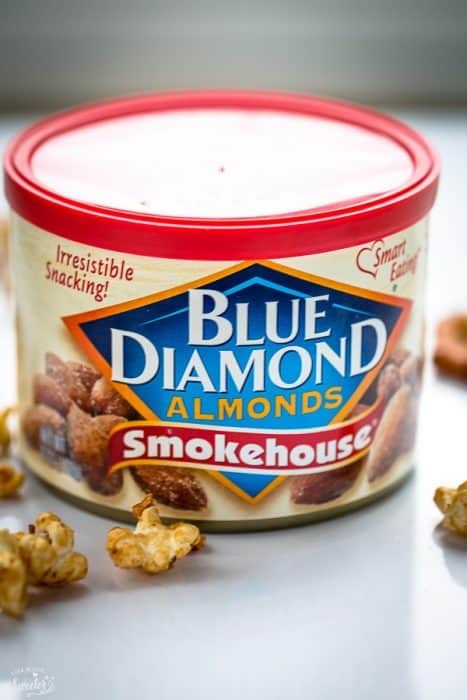 I used a can of these Blue Diamond Smokehouse Almonds and the crunchy, smoky nuts are a total game changer with the sweet and buttery caramel sauce. 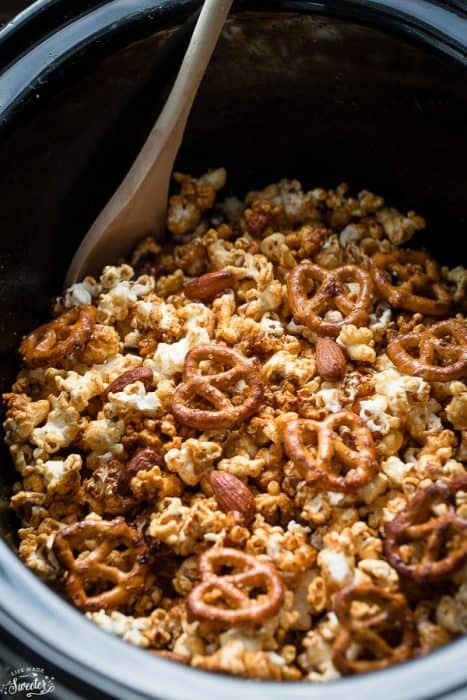 Toss in some salted pretzels and leave them in for about an hour, stirring every 20 minutes until it starts to get nice and coated. After letting everything cool down for about 15 minutes, get ready to pop until you can’t stop. It’s utterly addictive and before you know it, the entire batch could be gone like that. Make it ahead to bring to your next holiday party or package them up and give them away to neighbors and friends. The recipe is super simple and can easily be customized so you can totally make it again and again. 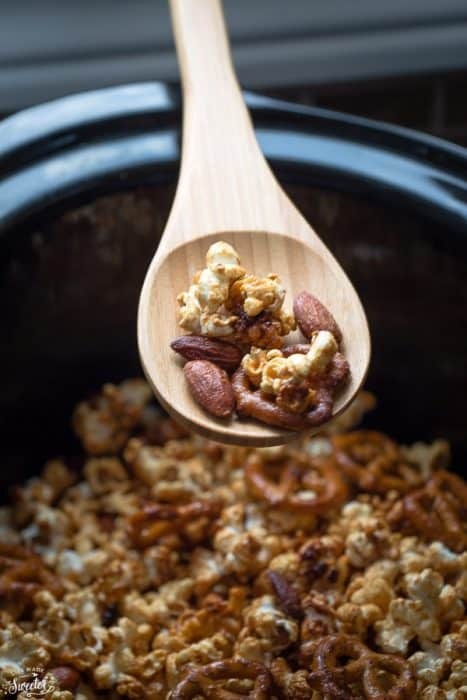 Slow Cooker Caramel Popcorn Snack Mix is sweet, smoky and super easy to make in a crock pot. A delicious snack to enjoy during game and perfect for giving during the holidays. Heat the butter, sugar, honey and vanilla in the slow cooker on high until melted, around 20 minutes. 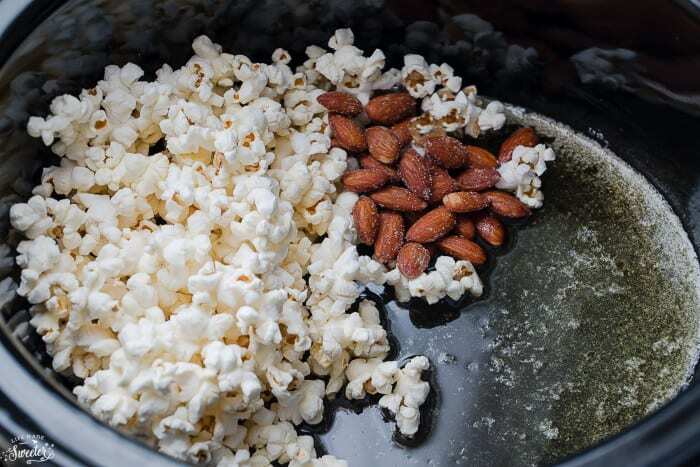 Gently stir in the popcorn and almonds. Cover and cook on high for one hour, stirring every 15-20 minutes. Remove cover and cook on low for an additional 30 minutes, stirring halfway. Spread onto a parchment lined cookie sheet to cool for 15 minutes.